We have bright faces in our Vacaville, Calif., pollinator garden. The bright faces are usually that of assorted bees and butterflies nectaring on members of the sunflower family: Mexican sunflower (Tithonia) and blanketflowers (Gaillardia). 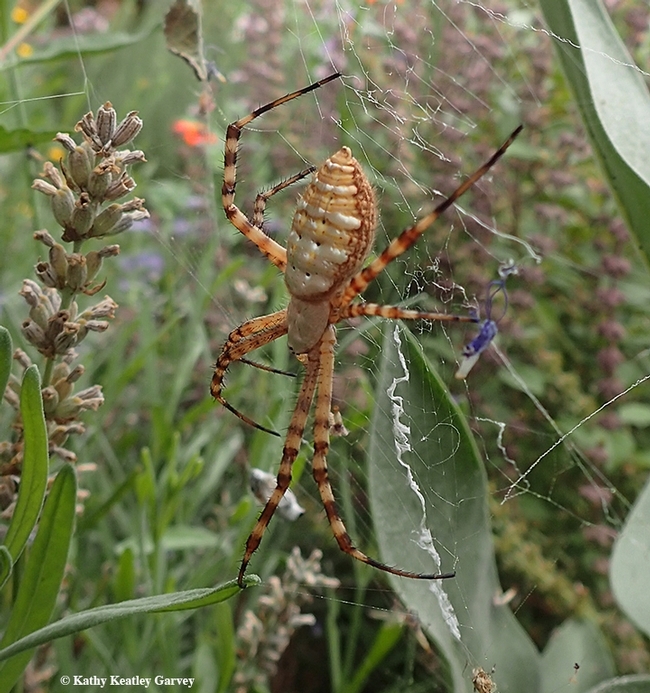 The Argiope trifasciata spider is found throughout much of the United States and Canada. It's also in Central and South America, Australia, the Mediterranean region, Africa, Sri Lanka, the South Pacific Islands, and China, according to Spiders of North America, which informs us that scientists have identified a combined total of 4000 spider species in the United States and Canada. Argiope trifasciata is just one of them, but what a beautiful spider it is. Clever and cunning, too. 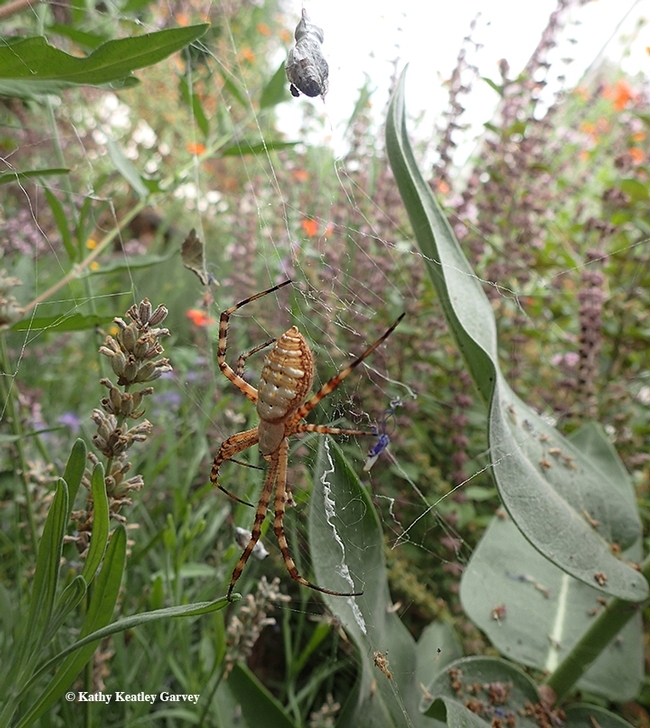 It had crafted a web inches from the ground between a showy milkweed, Asclepias speciosa, and bluebeard (Caryopteris clandonensis) amid patches of Mexican sunflower patch and African blue basil. Exactly where the bees are. It snared two of them one morning and wrapped them for later consumption. 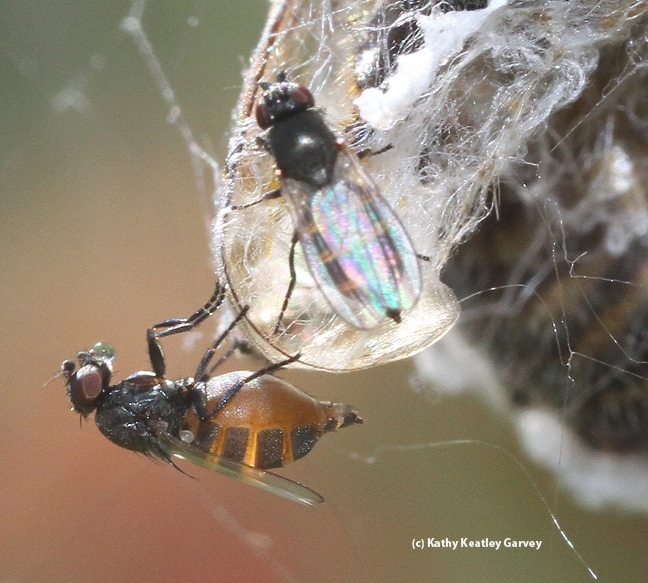 Meanwhile, an opportunistic and hungry freeloader fly, family Milichiidae and maybe genus Desmometopa, figured the spider ought to share its prey. It stopped to feed on the wrapped bee. 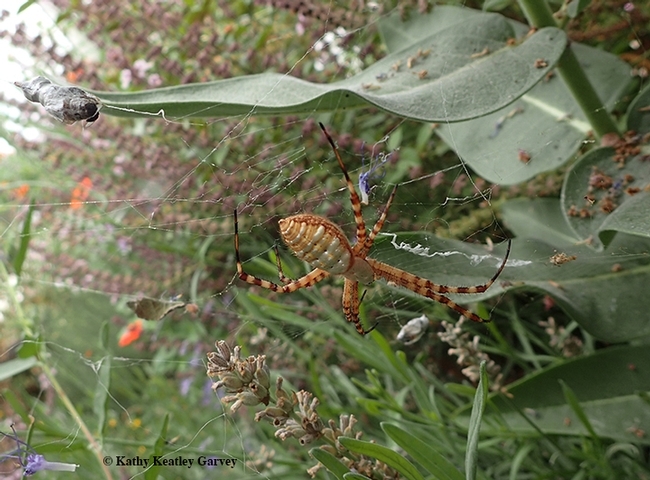 So, in actuality, there were two bright faces in the garden--the banded garden spider and the freeloader fly. The faces of the wrapped honey bees--not so much. There is such a thing as a free lunch. And a free breakfast. And a free dinner. That is, if you're a freeloader fly. 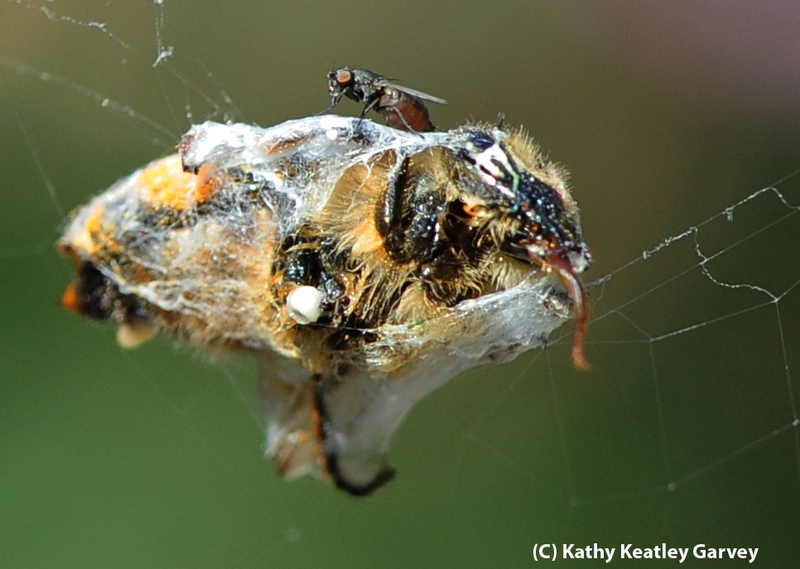 If you've ever watched a spider snare a bee or other insect in its web, and wrap it like a fit-to-be-tied holiday present, you've probably seen tiny little freeloader flies dining on the prey. They are so tiny--usually 1 to 3 mm in length--that it takes a keen eye to spot them if they're not moving. The eyes are often red though "this need not be obvious because many species of the flies are small and dusky." The close-up below is a hand-held photo taken with a Canon EOS 7D with a MPE-65mm lens. Plant Pest Diagnostics, California Department of Food and Agriculture. 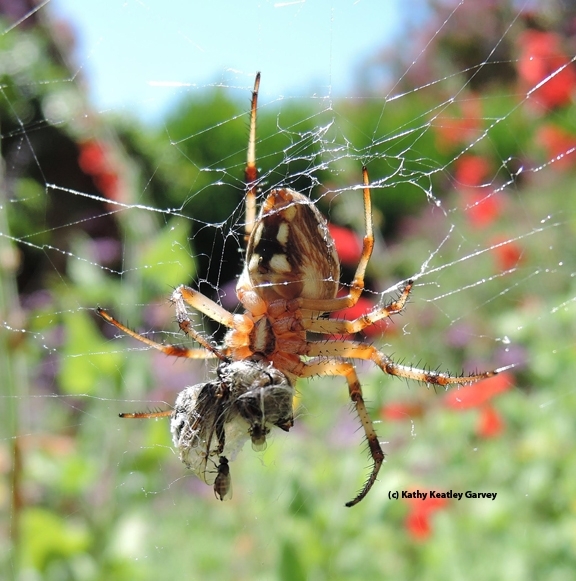 As it turned out, the spider dropped its prey and the freeloaders flies didn't have to leave the table. The next time you see a spider eating a bee snared in its web, look closely. The spider may not be alone. It may have a dinner companion. The common name, "freeloader fly," refers to the Milichiidae family. These flies are very tiny, about 1 to 3 mm in length, so you may not notice them. We took these photos with a 105mm macro lens last Friday at the Häagen-Dazs Honey Bee Haven, a half-acre pollinator garden planted next to the Harry H. Laidlaw Jr. Honey Bee Research Facility on Bee Biology Road, University of California, Davis. Bees are everywhere in the garden and so are the orbweavers--on the zinnias, cosmos, roses and the Mexican sunflowers. Predator catches prey, and here come the freeloader flies. There is such a thing as a free lunch. 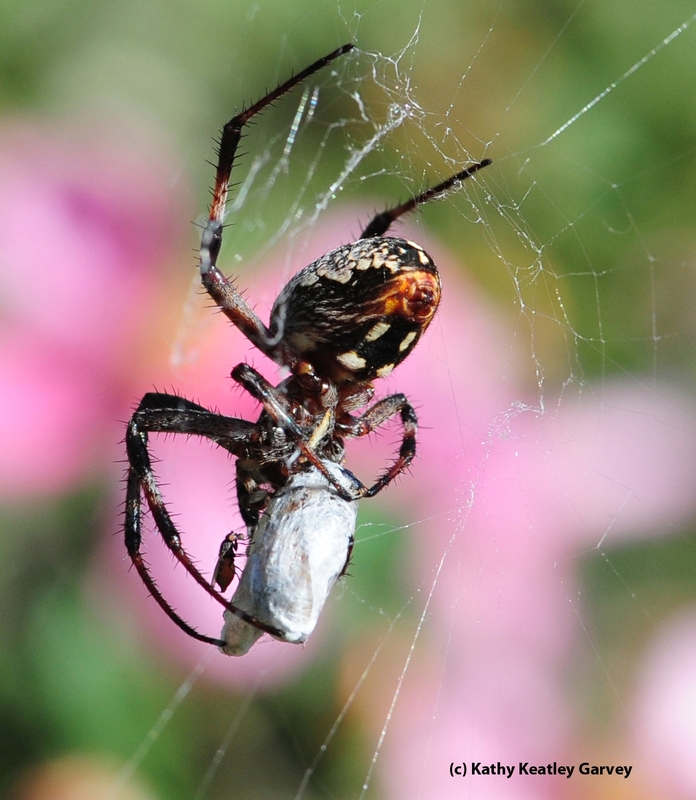 Sharing a meal with a hungry spider, however, may have dire consequences for the freeloaders. They may become a side dish to the spider's main course.